Using light and the techniques of the camera as a poet uses words and stanzas, Wynn Bullock’s exploration to reveal the unknown of the natural universe formed a new photographic vocabulary. Bullock turned to photography after moving to Paris in 1928; on seeing impressionist paintings he discovered that nature and its static representation could be revealed by light through the distortion of reality.2 He immediately purchased a Leica camera. On returning to America Bullock enrolled in photography at the Art Center School where he perfected his technique in solarising the negative rather than the print, a difficult method pioneered by Man Ray and Lee Miller. Following a lucrative career in commercial photography, Bullock met Edward Weston in 1948 and, impressed with Weston’s exquisite tonal variations, he commenced his new investigations of the landscape. Featured in the 1954 exhibition ‘Subjective photography: an international exhibition of modern photography’,3 Bullock was shown alongside his contemporaries Minor White, Harry Callahan, Aaron Siskind, Ansel Adams and Irving Penn who shared an approach to photography that went beyond representing pure form and light. 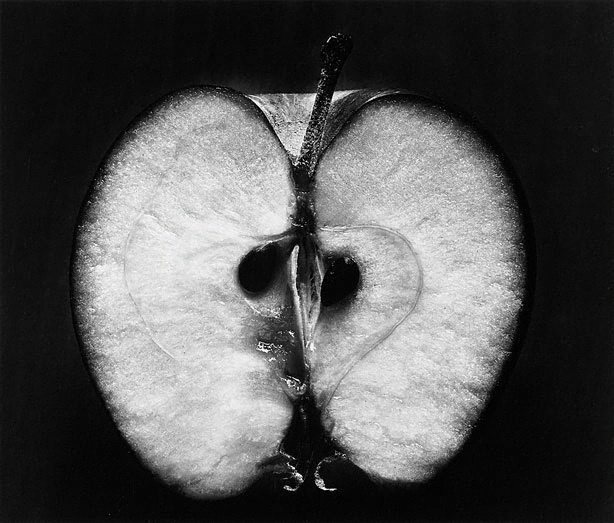 The richly toned photograph ‘Half an apple’ is indicative of Bullock’s desire to surpass the surface and reveal, through a kind of unconscious, the inner world of the object. He developed a space/time principle that sought to juxtapose opposites such as life and death, youth and age that in their opposition formed a whole, making visible to the eye what was invisible. Capturing the sensual flesh and swirling form of the apple, Bullock’s technique of increasing the exposure over several minutes creates great depth of detail. In the short time between being cut and starting to rot, the apple’s juiciness and dark core are revealed in an abstraction that removes the fruit from its primary function as food and makes it an ephemeral object. Donna Brett, Photography: Art Gallery of New South Wales Collection , 'A postwar modernist vision', pg.209-225, Sydney, 2007, 216 (illus. ).